Adventures with Jude: Come, Lord Jesus! We are celebrating Advent in our home. This year I actually had candles on time, and we were able to start celebrating with the first Sunday of Advent. Each night at dinner last week, we lit the first purple candle, and now are lighting the first and second candles. 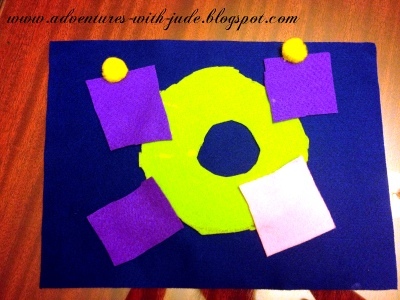 Unfortunately, Jude's craft wreath got lost in the shuffle. We all came home from vacation in various states of flu recovery, and Jude had an extended vacation. (Apparently there is no "substitute teacher pool" with homeschooling.) Tonight, while Neal took the big kids to Mass, we caught up on our Advent wreath and devotional. 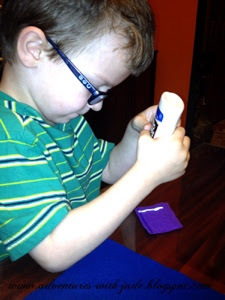 Draw candle outlines on purple and pink felt. Cut out candles. 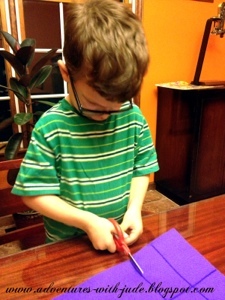 Jude is working on straight-line cutting, so I drew 2 lines parallel to the short side of the purple, and one on the pink, about 2" apart. I also drew a line dividing the strips in half, for Jude to use as a guide for cutting. 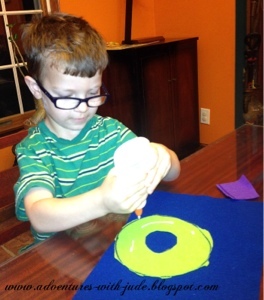 Draw a large circle on the green felt, and a smaller circle in the middle. Cut out so you have a "ring" with an open center. With a little help, Jude was able to cut along the outer line of the wreath. I needed to cut the inside one for him - his motor skills weren't up to it. 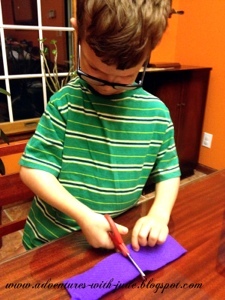 Apply glue to the wreath and center on the blue felt. Space three purple and one pink candles around wreath, and attach with glue. You will have extra pink/purple "candles" from the cut strips. Save them for another project that just needs some scraps, if you like. Add pom poms for "flames." If you are "lighting" one candle each week, start with the purple candle OPPOSITE the pink candle for the first Sunday of Advent. Work around the circle so that a second purple is "lit" for the second Sunday, the pink candle on the third, and the last purple candle on the fourth. 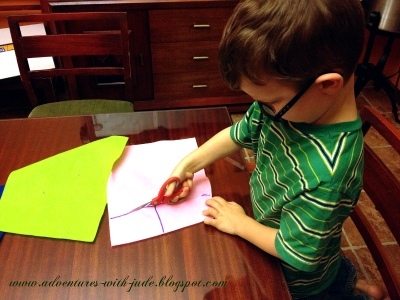 You can also cut out felt leaves, berries, flowers, etc. to decorate your wreath if you like. Quietly (Lk. 1:18-20) Zechariah cannot believe he and his wife will have a son; because of this, god strikes him mute. "..Zechariah waited once again. He waited for the birth of his own son. He waited for God's promise to come true. And he waited quietly..."
Humbly (Lk. 1:35, 38) highlights the story of the Annunciation: "'...I am God's servant,' [Mary] humbly told the angel. 'I will do just as God asks...'"
The daily stories and prayers are short enough to keep Jude's attention, yet still have significant content. The little prayers and thoughts at the end of each "day" help prepare our hearts for Jesus to come. Now that we have caught up, we will read one each day as we progress through Advent. 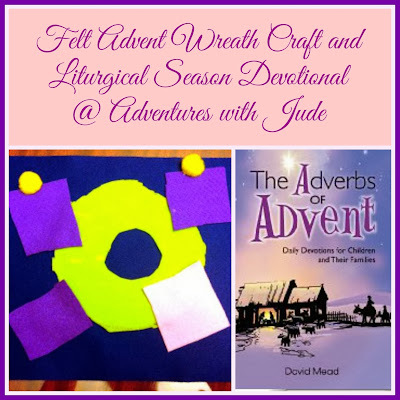 The third week of Advent advances the Christmas story a little "early" - as it focuses on Jesus' birth itself. However, this allows the fourth week of Advent to move from the stories of the Bible into today, and celebrating the birth of the Babe and God's promises fulfilled. With the words "Now," "Joyfully," "Hopefully", and "Forever" the adverbs allow us to celebrate the coming of Jesus so many years ago and prepare us to await his return. 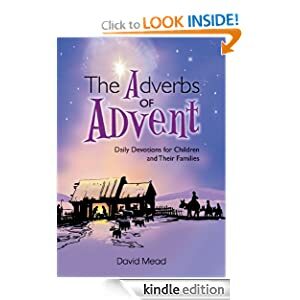 It is written in a way that it can also be completed after December 25 (if the fourth week of Advent only has a few days and is not an entire calendar week). Great Advent wreath! We're doing Truth in the Tinsel for an advent study, but we're running a little bit behind. I love this! I'll have to check out that e-book, thanks for the suggestion. Stopping by from the Blog Cruise. Loved your idea. We are using Everyday Advent from What's in the Bible for our Advent study. We are using a real wreath I made for a ladies Christmas event at church. I am stopping by from the Blog Cruise. Wondering how you made the Sharing Christmas button. I am participating and I thought that was great.